Easy Vegetable Spring Rolls Recipe – Spring rolls are the most favorite starter or snack dish recipe. Basically it’s a Chinese dish and famous among kids. If you travel the world you would see countless variations in spring rolls. But I’ve decided to post Indo-chinese recipe of spring roll. Eating an Indo-Chinese dish outside is definitely not a good option as they use aginomoto in their dishes. You can prepare it at home so that you have control on ingredients which you are going to use. Aginomoto is a type of salt obtained from sodium and amino acid and glutamic acid and most common in Chinese dish. So, it is not good for health. In place of aginomoto we are going to use black salt. So let’s start with the amazing Indian starter – quick and easy spring rolls recipe. Boil noodles and chop all the vegetables thinly. Add onions, ginger and saute them. Add all the veggies and boiled noodles to the pan. Add 2 tsp soya sauce and black salt (to taste) to it. Mix it and simmer for 10-12 minutes. Take a bowl and add maida, oil and salt. Knead dough. Make wrappers from dough and roast it on tawa. When the sides begin to peel off, flip the wrapper and again roast it for 30 seconds. Now take a roasted wrapper and put some stuffing on it. Fold the wrapper and seal it. Preparation for stuffing : Take a pan and add water to it. Add noodles and boil them. Meanwhile, wash all the vegetables and remove the roots and leaves. Put all the washed vegetables on chopping board. And chop them into thin strips. Chop coriander leaves and green chili finely. Keep it aside until required. Prepare The Stuffing : Take a pan and add 2 tbsp oil to it. Heat it and add thinly sliced onions and ginger. Sauté them until onion turns golden in color. Now add thinly sliced cabbage, bell pepper, carrots and finely chopped green chili. Mix it well. When vegetables get tender, add boiled noodles to it. Now add 2 tsp soya sauce, salt (to taste) and coriander leaves to it. Stir it and simmer it for 10-12 minutes on medium flame. Stuffing is ready now. Turn off the flame. Prepare Dough For Wrapper : In a big bowl, take Maida flour (Fine Flour) and pour 2 tsp of Ghee/refined/Clarified Butter in it. Mix it gently. To make it softer, add some water and knead it. To avoid lumps knead it with warm water. Rub it with your fingers and palm until the dough becomes soft. When the Dough is ready, cover it with damp cloth and keep it aside for 15-20 minutes. How To Make Wrapper : Now make small balls from dough. Take a ball, dust with dry maida, and flatten each ball with the rolling pin into 5-6 inch diameter thin puri. Grease a non-stick pan with oil/clarified butter. Put the wrapper on pan and when the sides begin to peel off, flip the wrapper and again roast it for 30 seconds. Repeat the same process for all wrappers. Fill The Stuffing In Wrapper : Now take 1 roasted wrapper and put some stuffing on one of its edge. Start rolling the wrapper. Now grease the sides of wrapper with little amount of flour paste and seal it. Seal all the open sides of roll. Repeat the same process for all rolls. Deep Fry Spring Roll : Take a pan and add required oil/clarified butter to it. Heat it. 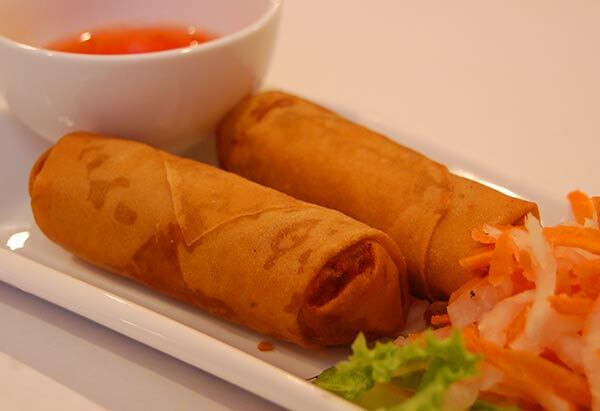 Now add spring roll to the pan and deep-fry it on medium flame until it turns golden in color. Fry it from all sides carefully and lightly. Take out spring roll with the help of slotted ladle, to drain extra Ghee or oil. Turn off the flame. Put rolls on tissue paper and cut it into 3-4 pieces. Serve : Serve hot with red, green and chili chutney and with salad. Add spring onions if you want. You can also take any seasonable vegetable.